But just because everyone else is buying Infinity Ward's latest military shooter doesn't mean you should, right? Lets see. Brian Crecente, who's played through the Call of Duty: Modern Warfare 3 campaign, lots of coop and hours of multiplayer: Despite the fact that a bulk of the Call of Duty series' success rides on the popularity of the game's multiplayer, a lot is still made about the game's narrative-driven, single player, and rightfully so. This year's Call of Duty returns to the Modern Warfare storyline, making a valiant attempt at not just reining in some of the game's increasingly absurd plot points, but also drawing the whole thing together and in many ways wrapping up what feels an awful lot like a trilogy. The eight-hour-or-so ride is more succinct than Modern Warfare 2's and not quite as punctuated with memorable moments as the original Modern Warfare, but overall it's a satisfying experience. It also does a wonderful job of introducing and then handing the story off to a new set of intriguing characters. Online the game feels better than previous Call of Duty titles, but not by much. The game's additions are subtle and nuanced, all things that casual players may either miss or be confused by. That isn't to say that the experience is any less fun than previous Call of Duty games, it just isn't overwhelmingly better. The biggest change this year is in the game's use of the mostly free Elite service. Elite is still limping along, suffering from server outages and hiccups, so it's hard to tell just what sort of bigger impact it will have on the experience. When I can get into it, though, it seems to be the sort of thing I can see spending a lot of time noodling around with. I'm not convinced, though, how much value it will have for casual gamers. The fact that Call of Duty: Modern Warfare 3 wraps up a year's-long, multi-game story is a big deal for fans of the series. It was for me and I enjoyed it. I also spotted some smart level design and AI improvements. The multiplayer is just good enough and comes with enough new maps and modes, to spur anyone who enjoys a little Call of Duty to pick this game up. Modern Warfare 3 may not reinvent anything, but if you're a fan you'd be silly to pass it up. Yes. Stephen Totilo, who was ready to skip Call of Duty this year: The Battlefield 3 campaign has disappointed me and its multiplayer is so impressively grand that I can feel lost in it, so I find myself surprised to turn to the Call of Duty series, the series I usually play primarily in single-player, for a hopefully better overall experience. I've not touched this game's new campaign; I've just watched people play a few levels. From the campaign, I'm expecting something less interesting than the strong first-person shooter mid-20th-century period piece Call of Duty: Black Ops provided last year. This game's high-octane, globe-trotting campaign, tired formula and all, may be the first one I skip of the series, but to the multiplayer I'll go, where I finally have found the kind of co-op that I crave and a competitive multiplayer system that is promised—no, I've not played this part either—that is supposed to reward team play and support play. If this is indeed a Call of Duty in which I can finally excel at in multiplayer without being a crack shot, I'm in. My enthusiasm is limited, but I'm willing to give this experiment one more try. No one should commit to buying MW3 without taste-testing Battlefield 3 as well. I can afford both. To this one, I say: Yes. Brian Ashcraft, Modern Warfare 3 non-player, who *still* likes WWII: I actually have yet to play Call of Duty: Modern Warfare 3, even get a hands-on demo at tradeshow. While I've ended up coming across spoilers here at work and on the web, I'm going into MW3 with an open mind, ready for Infinity Ward to dazzle me with another big time shooter. I feel like it's one of the games this year I have to play—that alone warrants a recommendation. 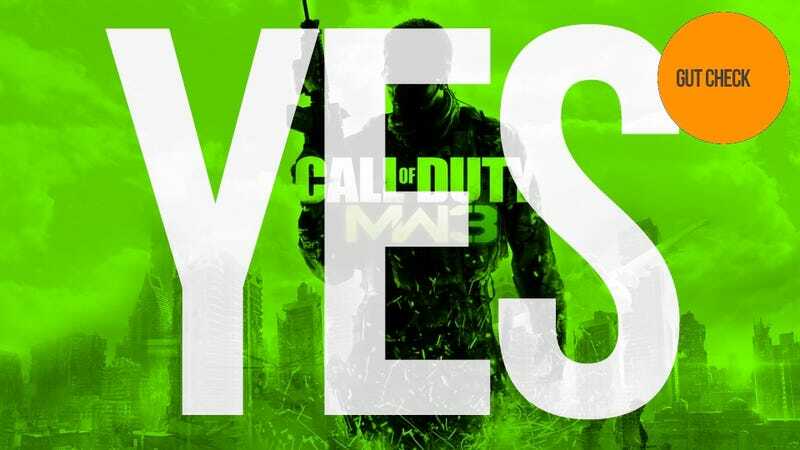 Not because I'm expecting it to be great, but because it's Call of Duty, one of gaming's biggest popcorn franchises; Modern Warfare 3 is a summer blockbuster in the dead of fall. While the Call of Duty games don't impress with subtly, they do offer big, if not implausible, thrills, both offline and on. And more importantly, the gameplay becomes increasingly nuanced and improved with each iteration. I remember being incredibly impressed with the first Modern Warfare, and maybe, just maybe, the third installment packs a punch. Yes.